Telefónica has today presented in a real environment the applications in rescue and supervision of the miniaturization of a 4G mobile network with a portable backpack of less than 3kg. which provides voice and data coverage to a group of people in a specific area. This innovation project, called LTE Nano and announced at the 2017 Mobile World Congress , is one of the world's smallest deployments of a 4G standalone network as it runs on hardware weighing just 40 grams. It is also a significant step in the advances that the market is making in the development of portable network products very useful in rescue, emergency, retail, logistics, hospitals or offices, among many others. Specifically, Telefónica has carried out demonstrations in Real of the application of portable networks 4G in rescue and supervision of critical infrastructures in Buitrago de Lozoya. 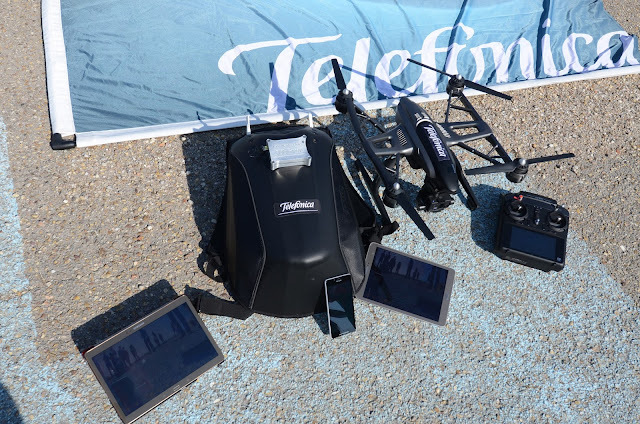 In both, a LTE Nano backpack has been used that has allowed to deploy in a matter of minutes a network of 4G communications to which a dron has been connected with capacity to transmit video through LTE and several smartphones and tablets with transmission of voice and data. In the case of rescue work, the 4G portable backpack has provided coverage of voice and data communications to a rescue group. A dron with an HD camcorder has streamed what was seen during the flight and has transmitted it to the devices of the operations in real time by the 4G provided by the backpack. In this way, for example, the location of a missing person is facilitated and accelerated in places that are not accessible. The same service can be provided in the supervision of infrastructures that are difficult to access, both in communications and in any other industrial field, involving tasks of a certain complexity and risk and time consuming. In this case, the use of a 4G dron has been shown for the monitoring of the old satellite communications monitoring antennas of Telefónica in Buitrago de Lozoya which, with its 30 meters in diameter and placed more than 40 meters high on a infrastructure of several hundred tons, pose a challenge of supervision because of its complexity and risk when an operator has to perform this task manually. The LTE Nano solution has been developed in collaboration with the British company Quortus, which is the technology provider that provides the 4G virtual network software solution capable of operating in such small scale equipment. On the other hand, the scenarios of using a dron transmitting video through 4G have been developed in collaboration with Accenture Digital , one of the first companies to collaborate with Telefónica in the development of innovative services that operate on 4G portable networks. Here is a video released alongside with the text above. I wish it had a bit more detail.